PST Viewer of corrupted Microsoft Outlook Personal Store Files. How can I view the contents of MS Outlook PST files? Our company offers a software product for viewing data stored in pst files - Outlook Recovery Toolbox (download). Microsoft doesn't supply special programs for viewing MS Outlook pst files except for Microsoft Outlook itself. This pst viewer does not use libraries and tools for viewing pst files provided by Microsoft. Instead, Outlook Recovery Toolbox reads, scans and recognizes the contents of the initial Outlook pst file. Tool allow viewing pst files without Outlook. 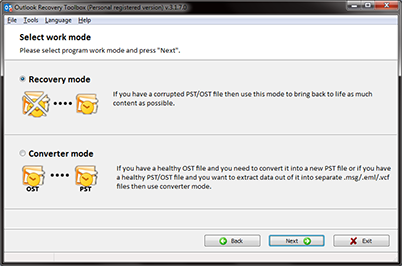 The user selects a pst file to be viewed, and Outlook Recovery Toolbox shows the contents of the pst file so the user can view and save it. The pst viewer shows the file similarly to Microsoft Outlook. 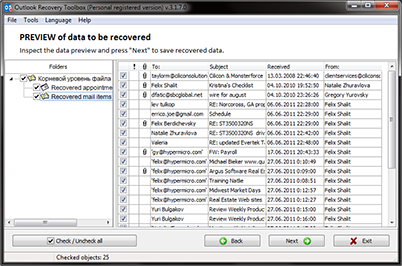 The left pane of the pst viewer displays the folder tree of the initial file. The right pane shows the objects located in the folders. The pst viewer allows viewing the headers of objects and some main properties: Date/time when it was created/received, sender, recipient, etc. Such limitations of viewing were introduced because the main purpose of Outlook Recovery Toolbox is recovering Microsoft Outlook data files rather than viewing pst files. The program allows saving your messages, contacts and other information from the initial pst file to new pst files or exporting messages to .eml format, contacts - to .vcf format and notes - to .txt files. Outlook Recovery Toolbox is Outlook .pst reader for corrupted database files. The .pst file reader do not modify and correct source files. 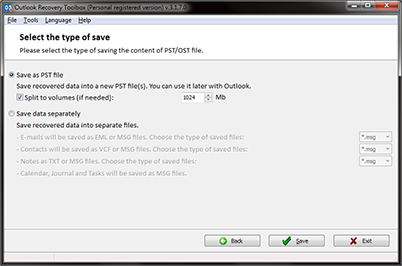 The Outlook PST Reader can read all types of Outlook files: ANSI Outlook files (97/98/2000/2002) and Unicode Outlook files (2003/2007/2010 and above). How to read PST file? How to read PST files? How to view .pst files? 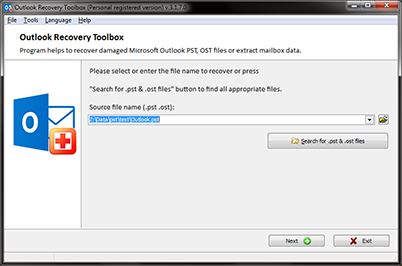 Outlook Recovery Toolbox is the .OST viewer for Microsoft Outlook and Microsoft Exchange Server OST files.